Eugene (Gene) Bovee’s first prank was his two- months premature birthing on April 1, 1915 in Sioux City, Iowa. The attending physician found him “too ornery to die”, which Gene keeps verifying to this day. Like many of the Society’s founding fathers, his education was hard-earned while growing up during the “Great Depression”. After graduating from high school with high honours, he did not immediately enter college. By 1936 he had saved enough money from working at odd jobs to enable him to enter Iowa State Teachers College (now the University of Northern Iowa). He graduated in 1939 with special awards in biology, the physical sciences, and journalism. He spent one year (1940-41) doing graduate work at the University of Iowa. It was during that year that he met two faculty members, Ted Jahn and Robert L. King, who would later play major roles in Gene’s professional career. Gene spent 1941-42 teaching biology and other science courses at a high school in Greene, Iowa, where he married Maezene Wamsley. Soon afterwards, he was drafted into the United States Army and taught at Camp Grant, Illinois. He was commissioned as a lieutenant in the Military Intelligence Service, and spent the rest of his military service in England and France. After returning to Greene, he worked for a short time as a journalist, and later taught biology at Iowa State Teachers College where he also began his master’s research (M.S. Iowa University, 1948). His thesis research on the effects of temperature on the growth of the amphipod Hyallela azteca was performed at the Iowa Lakeside Laboratory, where he again met Ted Jahn and Robert King. Gene enrolled in Jahn’s protozoology course and his outstanding performance resulted in him being recruited by Jahn to work on free-living amoebae for his Ph.D. dissertation at UCLA. In 1948 Gene was also recruited to membership in the fledgling Society of Protozoologists. As a graduate student at UCLA, he served as a teaching assistant (general zoology, human physiology, protozoology) and also taught comparative vertebrate anatomy at Los Angeles City College. Despite this teaching load, he managed to complete the requirements for the Ph.D. degree and graduated two years later in 1950. After obtaining his Ph.D. degree, Gene taught at California Polytechnic College (1950-52), North Dakota State University (1952-53), University of Houston (1953-55), and University of Florida (1955-62). 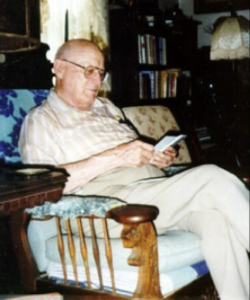 By then, Gene was well recognized as an authority on the taxonomy and systematics of the amoebae and was producing artistic drawings and sculptures of his favorite group of organisms (he also paints, writes and publishes poetry and prose, and composes music for bands and woodwinds). He was an early proponent of the actomyosin-based mechanism of motility of amoebae and had also worked on cellular ion-regulation. In 1962, he re-joined Jahn’s group at UCLA, this time as a research zoologist. In this capacity, he served as co-principal investigator on grants, chief writer, artist, bench researcher, and taught courses for Jahn when he was out of town. In 1968 Gene moved to the University of Kansas with his second wife Elizabeth, and remained an active faculty member for 17 years. There he mentored 10 Ph.D., 22 M.S., over 20 undergraduate research students, and added to his list of publications, which numbered well over 100. He served as President of the Kansas Academy of Sciences (1979-80); was elected Fellow of the Iowa Academy of Science (1958); and received the University of Northern Iowa Alumni Achievement Award in the Sciences (1980). Gene served the Society of Protozoologists as Treasurer (1972-78), Vice-President (1970-71), President-Elect (1978-79), and President (1979-80). He was co-editor of the Society’s compendium An Illustrated Guide to the Protozoa (1st edition). In 1976, he was asked by Jahn to help him revise the popular and classic handbook How to Know the Protozoa. Soon after, Gene had to completely take over the project because a cerebral stroke essentially incapacitated Jahn. In 1979, shortly after Ted Jahn’s death, the revised edition appeared, co-authored by Theodore L. Jahn, Eugene C. Bovee, and Frances F. Jahn. In honor of Ted Jahn, Dennis Buetow, another of Jahn’s former students, and Gene established the Theodore Louis Jahn Fund and Award for the Society of Protozoologists. In 1999, while enjoying his hobbies of painting, writing and composing, Gene turned over his share of royalty income from sales of the handbook to the same Fund. The Society renamed the fund “The Theodore L. Jahn and Eugene C. Bovee Fund” and each Award THE THEODORE L. JAHN AND EUGENE C. BOVEE AWARD. This monetary award is presented to the student with the best presentation at an annual meeting of the Society. [Excerpted from information provided by E. C. Bovee]. Edna S. Kaneshiro; January 2000.